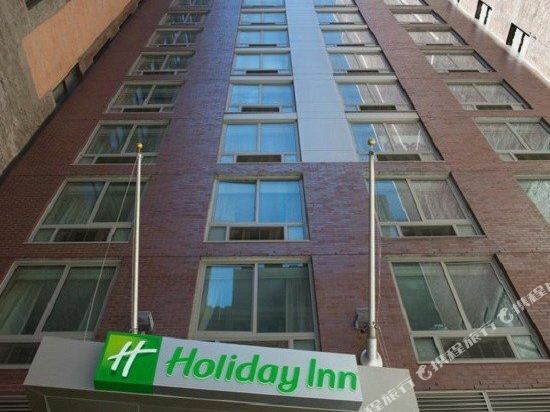 Holiday Inn Manhattan Financial District is conveniently located in the heart of lower Manhattan; it is the tallest Holiday Inn in the world.<br>Each of the 492 guest rooms here will provide you with views of the Statue of Liberty and the Manhattan skyline. Rooms include a 39-inch flat-screen TV complete with premium channels, and a spacious work area.<br>St. George Tavern is located in the lobby and offers guests a full bar with an Asian-inspired menu and relaxing pub ambiance. 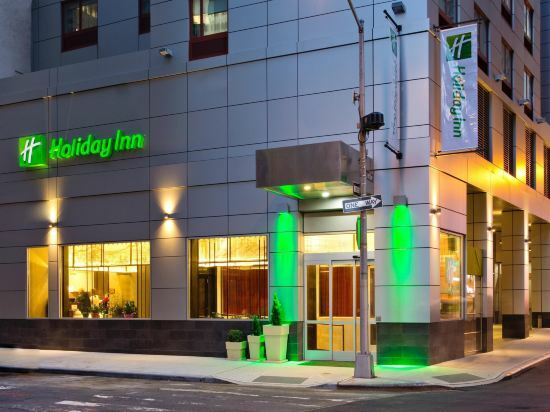 A front desk, concierge service and 24-hour fitness centre are just a few of the amenities offered by the Holiday Inn Manhattan - Financial District.<br>The hotel is 300 metres from Ground Zero and the National September 11 Memorial & Museum. Newark Liberty International Airport is 14 km away. 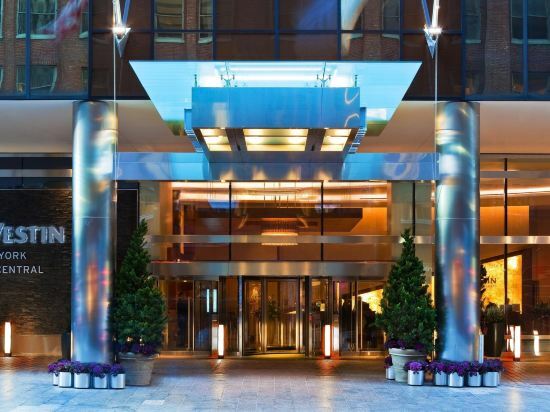 This luxury all-suite hotel in Lower Manhattan's Battery Park City features on-site dining and a fitness center. The property has over 2,000 pieces of art and its spacious suites feature 2 flat-screen cable TVs and an iPod docking station.<br><br>A minibar and espresso machine are provided in the contemporary suites at Conrad New York. The suites have a separate sitting area with a sofa and a desk along with a safe.<br><br>Conrad's restaurant offers upscale dining and there is also a seasonal rooftop bar. Room service is available. There are several additional restaurants and shops adjacent to the property.<br><br>Conveniently located just 1 block from North Cove Marina, Conrad New York is a 5-minute walk from the World Trade Center subway station and a 5-minute walk from the National September 11th Memorial and Museum. It is less than a kilometer from Battery Park and the Circle Line Statue of Liberty ferry. The Millennium Hilton New York is located in the Financial District across from the One World Trade Center site. The hotel offers a heated indoor pool and rooms with flat-screen TVs.<br>A minibar and iPod docking stations are standard in all rooms at the The Millennium Hilton New York. The rooms feature white and tan bedding with down pillows. Guests can relax with room service and an in-room movie.<br>Church & Dey is located on the 3rd floor and serves regional American cuisine with a daily continental breakfast buffet. The lobby bar, Liquid Assets features cocktails and street views.<br>The hotel offers a concierge desk, with information on area events and activities. The hotel also features a state-of- the-art fitness center with flat-screen TVs.<br>Wall Street is within a 10-minute walk of the The Millennium Hilton New York. Greenwich Village is 3.2 km from the hotel. The World Trade Center train station is adjacent to the property. 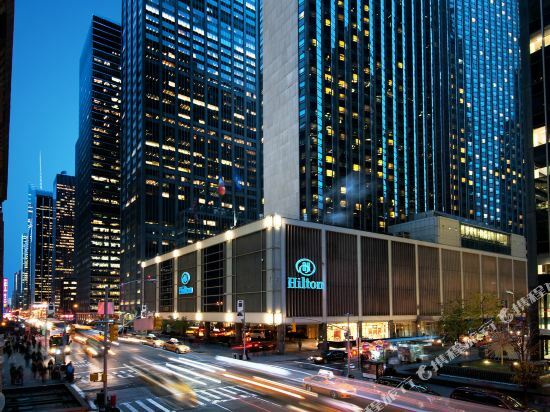 New York Hilton Midtown is located at Rockefeller Center in the heart of Midtown Manhattan. 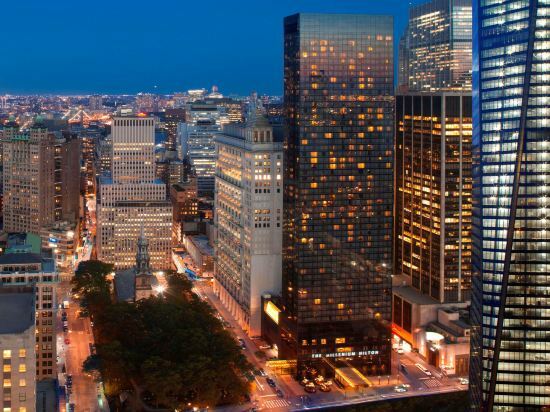 <br><br>For the best vantage point in New York City, choose the stylish Hilton New York Hotel in New York City. 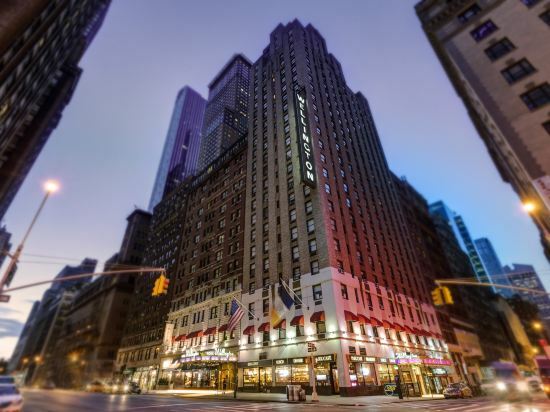 Beautifully re-designed, this exquisite Midtown Manhattan hotel features spacious accommodations just steps from Radio City Music Hall, Central Park, Rockefeller Center and the city’s dynamic business and media center. Intercontinental New York Times Square is towering 36 stories above the city. It provides guests with front row seats to New York’s impressive skyline and Hudson River. It is situated in the Broadway Theater District.<br>Intercontinental New York Times Square offers spacious rooms with well-lit work desk and sofa bed. Each unit is equipped with a satellite flat-screen TV, coffeemaker and minibar. The modern bathroom includes a hairdryer.<br>The hotel’s Marketplace offers meals on-the-go, including pastries, snacks and coffee. Ca Va Brasserie reflects New York City’s dynamic and international culinary scene, serving seasonal French inspired cuisine. The restaurant offers guests a variety of unique options, from the relaxing ambiance of Ca Va's Fireside lounge offering specialty cocktails, to the more formal and intimate main dining room where guests can enjoy breakfast, lunch, or dinner.<br>This Intercontinental offers a 24-hour gym for those wanting to maintain their work out routine. Located on the third floor with views over 44th street, it features Stairmasters, lifecycles and treadmills. Free weights are also available.<br>This New York Intercontinental is one block from Times Square and less than one mile from Central Park. Port Authority Metro Station is just 3 minutes’ walk away. 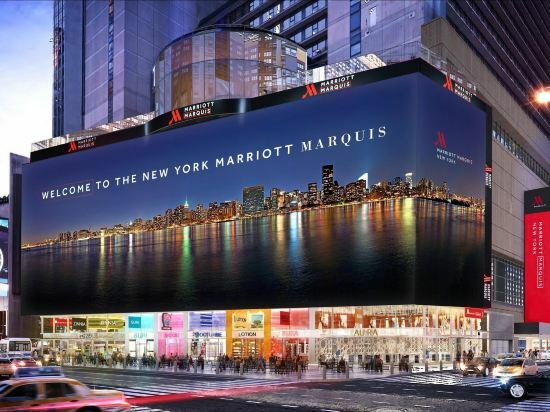 Welcome to the New York Marriott Downtown, a premier downtown Manhattan hotel previously named the New York Marriott Financial Center. In addition to offering an abundance of New York City vacation packages, we provide a superior level of luxury and service among hotels in downtown Manhattan. Ideally located in the heart of NYC's Financial District, with easy access to the World Trade Center site, Statue of Liberty, Ellis Island, South Street Seaport, and SOHO NYC, our downtown Manhattan hotel is perfect for business trips, weekend getaways or leisure travel alike. Our downtown Manhattan hotel near Battery Park offers 497 richly appointed hotel rooms, complete with the new luxurious Revive bedding, and also features the 85 West Sports Bar and Grill. The Marriott hotel staff looks forward to welcoming you to New York City, so come visit today, and experience all that the historic Financial District in NYC has to offer. 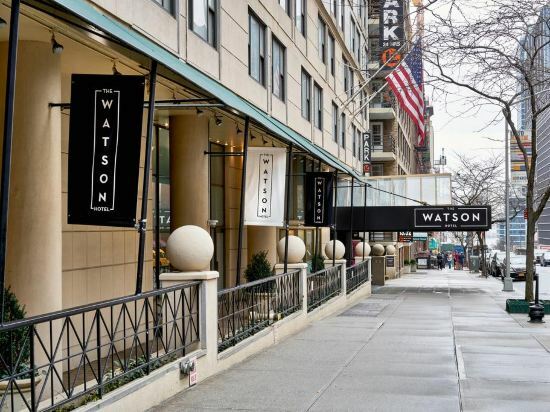 The Watson Hotel is located in energetic Midtown Manhattan, a short distance from 59th Street–Columbus Circle station and just steps from Central Park. Convenient access to the subway assures visitors can conveniently access the multitude of attractions that New York has to offer, including the Empire State Building, Times Square, and MoMA. Having easy access to Central Park means that visitors can partake in a variety of activities, such as paddle boating, ice skating, or having a picnic on the Sheep Meadow while surrounded by the towering skyscrapers of Manhattan.<br><br>There are several room types available, assuring the needs of all types of travelers are met. Guest rooms are equipped with LCD televisions, irons and ironing boards, Wi-Fi, and coffee makers. The pristine bathrooms have hair dryers available for use. <br><br>Those looking for a bite to eat can head to the Gotham Cafe Restaurant, where guests can eat at the breakfast buffet or order a la carte. For dinner and drinks, the Skylight Lobby Lounge serves American favorites and well mixed cocktails.<br><br>Guests who stay at The Watson Hotel are afforded the utmost level of convenience. A gift shop is located within the premises, assuring the perfect souvenir is never out of reach. The friendly hotel staff offer concierge, luggage storage, and 24 hour front desk services. During their downtime, guests can lay out on the seasonal rooftop deck or go for a swim in the pool. Gym use is also available. No matter how long guests stay at The Watson Hotel, they’re sure to have an unforgettable time. Offering a fitness centre, Hampton Inn Times Square Central is located in New York. Free WiFi access is available and guests can enjoy the complimentary continental breakfast. Each room here will provide you with a flat-screen TV, coffeemaker and ironing facilities. Featuring a hairdryer, private bathrooms also comes with free toiletries. Extras include a desk and a laptop safe. 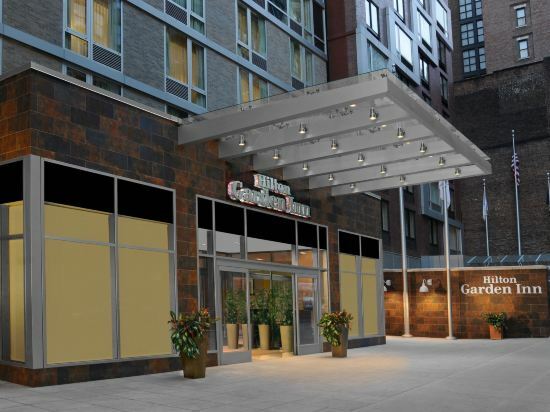 At Hampton Inn Times Square Central you will find a 24-hour front desk and a snack bar. Other facilities offered at the property include a shared lounge, a ticket service and a tour desk. The hotel is 300 metres from Times Square, 500 metres from Restaurant Row and 600 metres from Macy's. Newark Liberty International Airport is 18 km away. 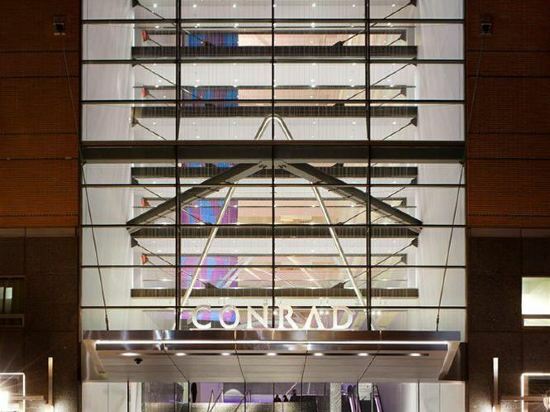 This 4-star hotel, located in the center of Manhattan, is only a 10-minute walk to Times Square. The elegant hotel features a 24-gym, spa services, on-site restaurant and in-room refrigerator. Each room at the New York Barclay InterContinental includes an iPod docking station and cable TV with a DVD player. A minibar and coffee facilities are also provided. The spacious rooms are decorated in gold tones. 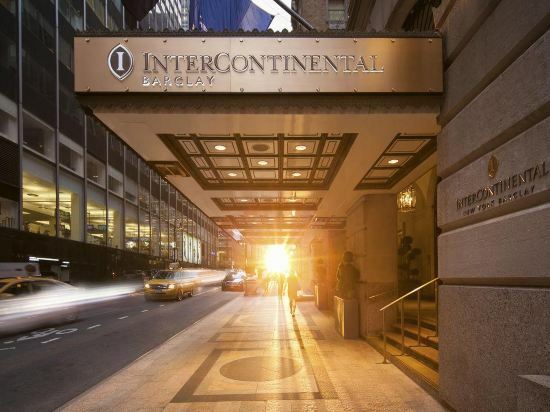 InterContinental Barclay New York offers concierge services and a full-service business center. Guests can work out in the gym or arrange for private massages. The Barclay Bar and Grill is located in the hotel’s lobby and open all day. Italian cuisine and cocktails are available. Luxury shops and restaurants along Fifth Ave are just a 5-minute walk from the InterContinental New York Barclay. Central Park is a 20-minute walk from the hotel and Rockefeller Center is a 10-minute walk away. Hilton Times Square is pleased to announce the completion of its guest room revitalization project in Spring 2013. Originally built in 2000 and soaring 44 stories above Manhattan, this upscale, full-service landmark hotel is located on famous 42nd Street (between 7th and 8th Avenue) in the heart of Times Square and is steps from Broadway theaters, lively nightlife, New York City's best shopping, Restaurant Row, Madame Tussaud's Wax Museum, Ripley's Believe it or Not, Rockefeller Center, Radio City Music Hall and much more.Boasting a modernistic fa?§ade and sweeping vistas of New York City's famous skyline and the Hudson River, the hotel is within walking distance of Jacob Javits Convention Center and all major bus/subway lines.Hilton Times Square offers 460 recently renovated, oversized guest rooms (330-360 sq. ft.) with sleek decor, spectacular panoramic views and high-end amenities including 46-inch flat screen television, laptop-size safe, refrigerator, MP3 players and more. Zagat-rated Restaurant Above overlooks Times Square and is open for breakfast, lunch or dinner.Additional hotel amenities include Pinnacle Bar (the hotel's chic lobby lounge) plus 24-hour business center, 24-hour fitness center, room service, and a Concierge/Theater Ticket Desk. For groups and meetings, the hotel has 5,500 sq. ft. of modern event space including a mini-conference center on the 22nd Floor.The hotel is 100% non-smoking. Valet parking is available. The hotel allows pets (under 75 lbs). There is 24-hour Security onsite. Located in Manhattan, this New York City Westin is 4 minutes’ walk from Grand Central Terminal and is 7 minutes’ walk from the United Nations. The hotel features a fitness centre, business centre and on-site dining.<br>The rooms at the Westin New York Grand Central include a flat-screen cable TV and a desk. Free toiletries can be found in the en suite bathroom.<br>Guests staying at the Grand Central Westin can enjoy the convenience of an on-site bar and lounge. The guests also have access to room service and a concierge service. Fax and photocopying services are available.<br>Times Square is 12 minutes’ train ride away. The Grand Central – 42nd Street underground station is 4 minutes’ walk from the hotel. 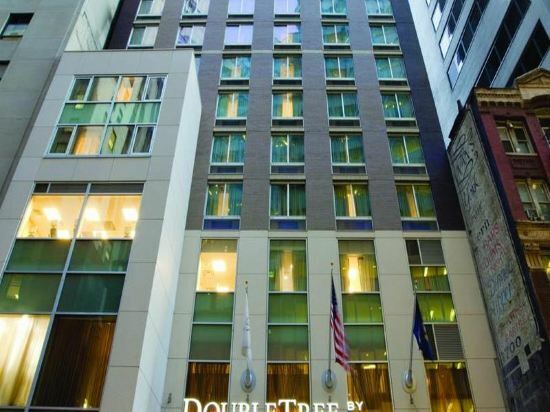 Welcome to DoubleTree by Hilton Hotel New York - Times Square West, just steps from the Broadway Theater District. Along with stunning views of the Empire State Building, our New York Times Square hotel offers an enviable location near Rockefeller Center, the Chrysler Building, Madison Square Garden and other iconic attractions. The Port Authority Terminal is moments away, and the Jacob Javits Center is a short walk – perfect when visiting for a convention. The 4-star Park Central Hotel offers comfort and convenience whether you're on business or holiday in New York (NY). Featuring a complete list of amenities, guests will find their stay at the property a comfortable one. Service-minded staff will welcome and guide you at the Park Central Hotel. Air conditioning, heating, desk, alarm clock, iPod docking station can be found in selected guestrooms. The hotel offers various recreational opportunities. 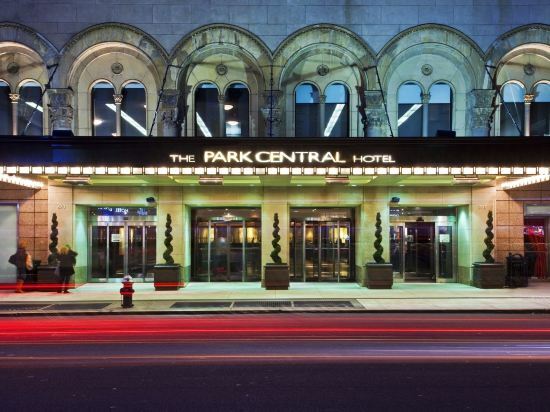 Park Central Hotel combines warm hospitality with a lovely ambiance to make your stay in New York (NY) unforgettable. Landmark New York Hotel and Uncommon Comfort For the finest accommodations, upscale hospitality and first-class service in NYC choose Crowne Plaza? Times Square - Manhattan . 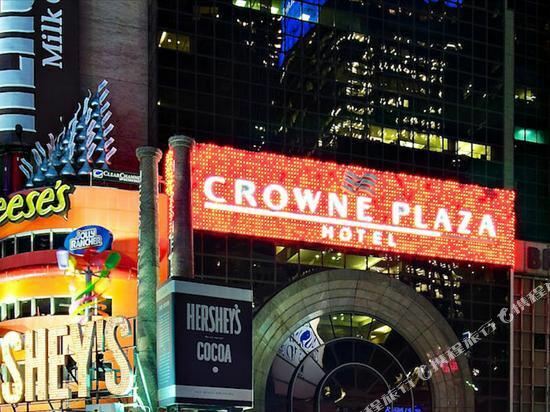 Our Midtown hotel's Times Square location is matched only by our outstanding service and 4-star elegance. An unforgettable location in the heart of New York gives our Broadway hotel guests easy access to Central Park, fabulous 5th Avenue shopping and the endless delights of the Big Apple. The verve of Times Square is just outside our front door. Unrivaled concierge service can lead you to the city's hidden gems and world-famous institutions like MoMA or The Met. TKTS is just one block from us, so you can catch the hottest shows in New York. Our flagship Broadway hotel is perfect for corporate guests. You'll be close to major corporations, and we offer the finest facilities and thoughtful details you demand, like quiet rooms and reliable Internet access. Dedicated Conference and Business Centers, concierge floors and more make doing business in Manhattan fun again. This Midtown hotel's breathtaking views of the city, freshly updated accommodations and new levels of comfort combine to create a dazzling oasis in New York. Our hotel and amenities are unrivaled, from superb dining to our unique, holistic approach to sleep, so you're ready for the new day. The Crowne Plaza? Times Square - Manhattan hotel is waiting to welcome you to the Big Apple. 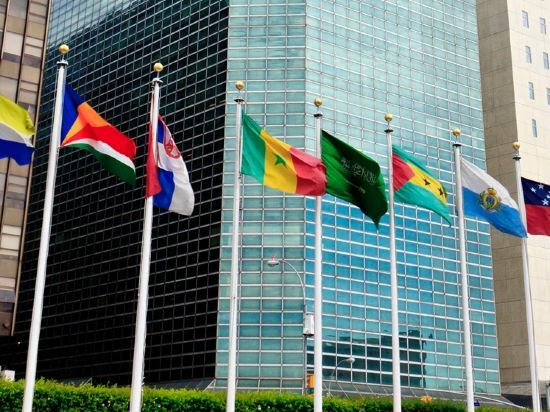 Millennium Hilton New York One UN Plaza is just steps from United Nations Headquarters. Times Square and the Empire State Building are within one mile of the hotel.<br><br>Located in Manhattan’s East Side and just 2 blocks from the Grand Central Terminal, this hotel offers an indoor tennis court. 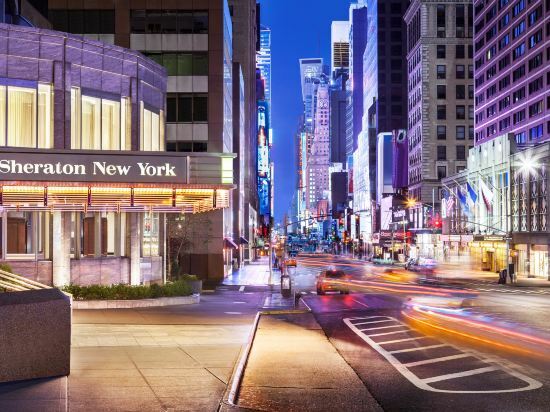 Guest rooms include 40-inch flat-screen TVs.<br> <br>At the Millennium Hilton New York One UN Plaza Hotels and Resorts, rooms provide desks and safety deposit boxes. The rooms start on the 28th floor and feature views of the East River or New York City skyline.<br> <br>A gym and full-service wellness center are available at the Millennium Hilton New York One UN Plaza. 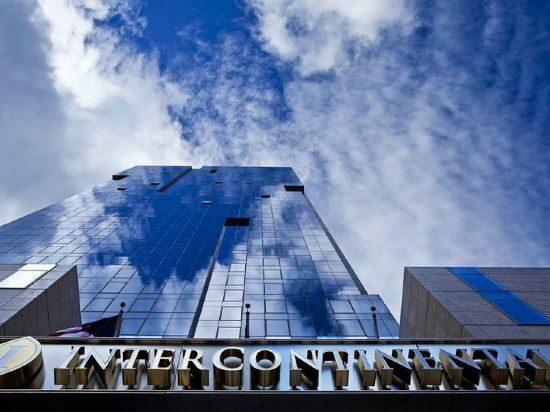 Their Ambassador Grill restaurant serves international cuisine.<br> <br>Millennium Hilton New York One UN Plaza guests can access a business center. For added convenience, the hotel offers a tour desk and ticket services. 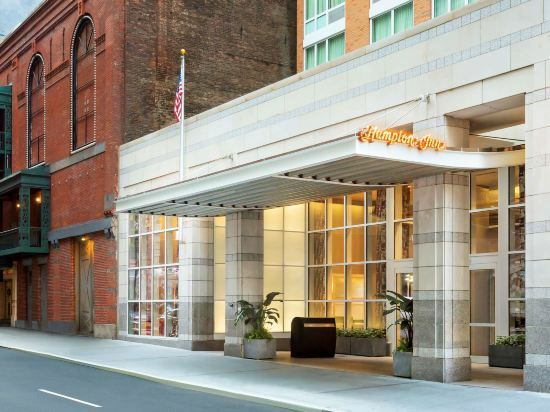 Set in the Stone Street Historic District of lower Manhattan, DoubleTree by Hilton Hotel New York City Financial District is a beautiful downtown hotel with magnificent views of Manhattan, Brooklyn and Ellis Island. Discover New Yorka? ?s most popular attractions, including the Statue of Liberty and the World Trade Center Memorial. Enjoy a warm, freshly baked DoubleTree chocolate chip cookie on arrival at this New York City hotel.Stay in a well-decorated guest room, featuring warm mahogany tones and rich colors. Keep up with work using high-speed internet access at the flexible work desk, or watch your favorite shows on the 32-inch flat-screen TV. Be productive in the hotela? 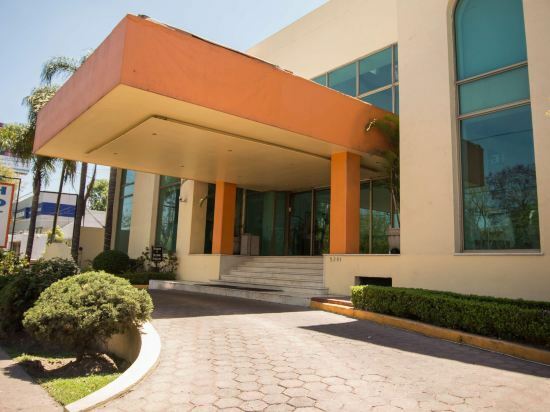 ?s fully equipped, 24-hour business center with high-speed internet, printing, and photocopying access, and book our boardroom for an important business negotiation.Stay active with cardiovascular machines and resistance equipment in the hotela? ?s fitness center. Begin each day with a delicious DoubleTree Buffet Breakfast and enjoy freshly prepared classic dishes at the hotela? ?s signature restaurant, the Ei8htstone Restaurant & Bar. Ideally located in the prime touristic area of Financial District, Q&A Residential Hotel promises a relaxing and wonderful visit. Offering a variety of facilities and services, the hotel provides all you need for a good night's sleep. Take advantage of the hotel's free Wi-Fi in all rooms, 24-hour security, daily housekeeping, fax machine, grocery deliveries. Guestrooms are designed to provide an optimal level of comfort with welcoming decor and some offering convenient amenities like towels, sofa, linens, air conditioning, wake-up service. The hotel offers various recreational opportunities. 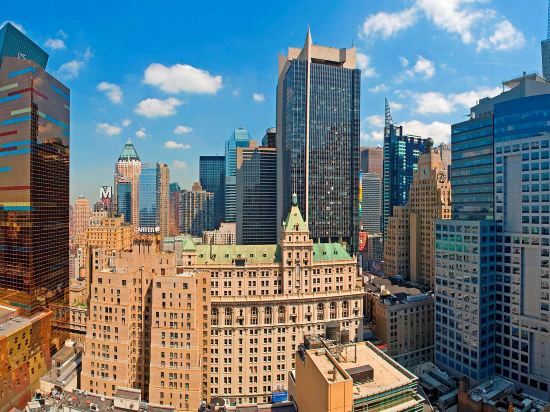 Discover all New York (NY) has to offer by making Q&A Residential Hotel your base. Featuring an extensive health center and a ticket service for popular New York shows, this luxurious contemporary hotel is less than one block from the 7th Avenue subway station.<br><br>Sheraton New York Hotel & Towers features sophisticated rooms equipped with flat-screen cable TV and an in-room coffee maker. A spacious window and a large desk with ergonomic chair provide a comfortable work area.<br><br>Hudson Market offers a breakfast buffet and Starbucks coffee each morning. Hudson Market Burger opens each evening, serving prime Angus burgers, sodas and milkshakes.<br><br>Guests of the New York Sheraton Towers have access to personalized dining and workout programs through the on-site fitness center. A computer center with free Wi-Fi is in the lobby and the 24-hour FedEx Office Print & Ship Center provides fax, copy and printing services.<br><br>The Sheraton Towers and Hotel is 4 blocks from Rockefeller Center and 5 blocks from Times Square. 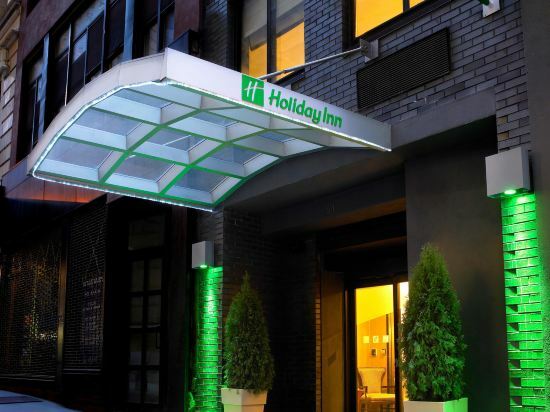 Holiday Inn New York City - Times Square Featuring free WiFi, Holiday Inn New York - Times Square South offers accommodation in Midtown Manhattan, 400 metres from the Theater District.<br>Rooms include a flat-screen TV. All rooms are equipped with a private bathroom with a bath or shower and free toiletries.<br>Times Square is 500 metres from Holiday Inn New York - Times Square, while Madison Square Garden is 500 metres away. The nearest airport is La Guardia Airport, 10 km from Holiday Inn New York - Times Square South. Expects classic design, intimate ambiance, personal service and striking moments at The Peninsula New York, located in Manhattan’s most prestigious shopping, cultural, and business neighbourhood<br>Centrally located in downtown Manhattan, this 5-star hotel boasts free Wi-Fi, a rooftop terrace and luxury spa with indoor pool. Rockefeller Center and Central Park are a 5-minute walk away.<br>Decorated in neutral colors, each elegant room offers a plasma TV, free Wi-Fi access, a fully stocked minibar and mood lighting. The marble bathrooms feature a built-in TV and plush robes. Most rooms overlook the city.<br>The Peninsual SPA has 12 treatment rooms, a hair salon and Asian Tea lounge. Saunas, a state-of-the-art gym with yoga studio and massage treatments are available.<br>The Peninsula New York’s dining venues combine the comfort of tradition with modern elegance for guests to experience sophisticated dining at any time of the day. The signature restaurant Clement presents an energetic approach to regionally-sourced cuisine for breakfast, lunch or dinner. The Bar at Clement offers thoughtful cocktails, wines by the glass and a light menu. After a day of exploring the vibrant heart of the city, the timeless Gotham Lounge is a welcome setting to rejuvenate over Afternoon Tea, or for an unforgettable end to a New York City day, toast from the spectacular rooftop bar and terrace, Salon de Ning, while gazing over panoramic views of the shimmering Manhattan skyline.<br>Guests can enjoy luxury shopping along Fifth Avenue, located outside the hotel. The Museum of Modern Art and 5 Av/53 Street Subway Station are 3 blocks away. New York City Hotel Is a Lower Manhattan Gem All the excitement, power and history of New York City seem to gravitate around the Holiday Inn? Hotel New York City - Wall Street. After all, we are close to the engine that drives the country's economy: Wall Street. 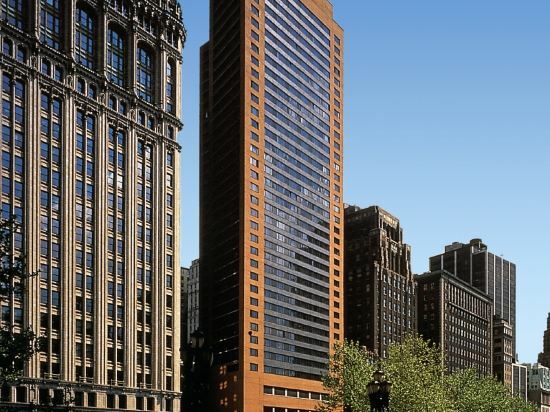 Just blocks from the Financial District, our hotel is also only a short walk from many other amazing sights, such as City Hall, Battery Park and the World Trade Center. Our hotel's Lower Manhattan location puts you just a mile from the ferry that takes you to the Statue of Liberty and Ellis Island. Little Italy, Chinatown, SoHo, the Brooklyn Bridge and Tiffany & Co's Wall Street store are also a quick walk from the hotel's front door. Lower Manhattan business travelers find that we're within blocks of the New York Stock Exchange and the Financial District. Our hotel has free high-speed, wired and wireless Internet access, so you can keep on top of work and the latest news. When you stay at the Holiday Inn? Hotel NYC Wall Street, you'll be close to many of the city's major subway lines, making it a 'piece of cake' to get to your meetings on time. The Business Center is open 24 hours, so you can be ready for anything in the Big Apple After a day of meetings or sightseeing, the Federal Cafe is a great place to relax and enjoy a delicious meal, and kids under 12 eat free. Stay with us on your next trip to NYC and experience the comfort and convenience of this terrific hotel! Staying at the Wellington Hotel New York provides the perfect opportunity to experience the uniqueness of the City of Skyscrapers. Located on 7th Avenue in Midtown Manhattan, the Wellington Hotel was built over 115 years ago. From the hotel, Times Square, Broadway, Carnegie Hall, Central Park, Rockefeller Center, and MoMA are all just a short walk away. The hotel’s superb location provides a level of convenience suitable for both leisure and business travelers alike.<br><br>Decorated in a style reminiscent of old New York, colorful paintings with gold trim are hung on the walls of the hotel’s lobby and a gorgeous green patterned carpet covers the floors. Since the building is surrounded by modernity, the hotel itself creates a juxtaposition of old and new. When guests enter the glass doors, it’s almost as if they were transported back to the Roaring Twenties.<br><br>Rooms and suites are furnished with solid wood furniture and the hotel’s emphasis on detail can be seen from the bedside lights to the paintings on the walls. The luxurious bedding assures guests will be able to get a good night’s sleep, while in the bathroom, complete sets of toiletries can be found. Rooms are equipped with microwaves and mini fridges for guests’ convenience and a variety of foods can be ordered through room service, making sure that guests are able to feel at home no matter how far away they are.<br><br>Molyvos, a top rated Greek restaurant specializing in seafood, is located on the same floor as the hotel lobby. The hotel also has its own café that serves snacks and American cuisine. The café’s seats by the window are perfect for people-watching and provide a retreat away from the hustle and bustle of the city. The Wellington Hotel’s business center is perfect for travelers looking to keep up with their work. If you want to stay in the best hotel in New York, United States, please come to Trip.com for a custom trip. Staying in exclusive New York St. Paul's Chapel hotel Trip.com offers, you can fully relax and enjoy the stay in New York and around New York. 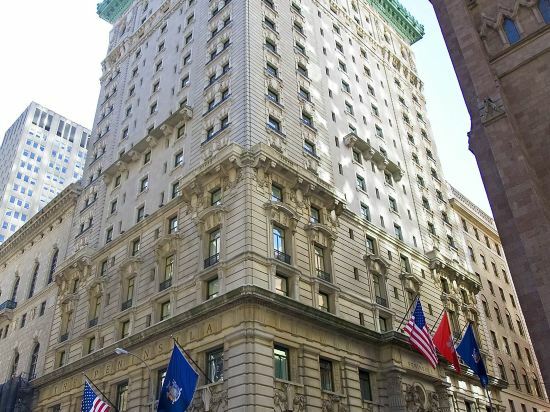 All these New York St. Paul's Chapel hotels lead in the industry in aspects of environment and recreation facilities, providing the best hotel service in New York. To ensure that you can find the latest St. Paul's Chapel hotel in New York, the latest hotel price as well as hotel facilities and indoor facilities information will be offered. In the meantime, detailed photos of New York St. Paul's Chapel hotel will be displayed, making you know quickly whether hotel’s interior environment meets your taste. Besides, you can know specific location and reviews on New York St. Paul's Chapel hotel from millions of users. If you want a nice room with limited budget, please filter through price and distance to get an appropriate New York St. Paul's Chapel hotel. To ensure you can experience the best New York St. Paul's Chapel hotel, users and we give a comprehensive rating on hotel, which gives useful help. Believe it or not, as the biggest online travel service company, we have the best service assurance and perfect users’ experience to meet your requirements in different aspects, no matter it’s New York hotel or New York St. Paul's Chapel hotel. New York hotel information & deal: Check out room rates, photos, a map and reviews of hotels in New York and find the best deals on New York hotels. 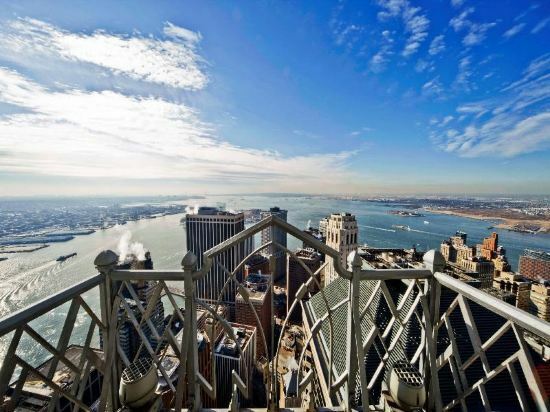 Trip.com offers big savings on online reservations for New York accommodation. Book New York vacation packages and New York tours with huge discounts on Trip.com!